The Druk Foundation for Art Preservation is a recognized 501(c)(3) charitable entity based in the United States. The Foundation is leading an international fundraising effort to build Bhutan’s first conservation centre for Buddhist art, which will be under the auspices of Bhutan’s Central Monastic Body (Zhung Dratshang). With this permanent state-of-the-art facility, sacred arts and cultural artifacts of Bhutan and the Himalayas can be preserved and restored by a very unique group of conservators - the monks of Bhutan. The purpose of the Foundation is to raise funds to build the Centre, which includes a café and a gift shop, and to create an endowment for operation and maintenance of the Centre. The immediate fundraising goal is to raise at least $1.6 million to begin construction of the much-needed conservation building. For centuries, monks have served as custodians to Himalayan Buddhist art. It is only fitting that Bhutan’s monastics have continued in this role today as the conservators of ancient thangka paintings and Buddhist art works. The Druk Foundation for Art Preservation is working in collaboration with Bhutan’s Central Monastic Body (Zhung Dratshang) to empower the monk conservators with the right tools, techniques and training. The Buddhist Art & Cultural Conservation Centre is the first of its kind, combining modern conservation techniques with the ancient wisdom and compassion of a monastic institution. Already, more than 400 sacred works have been preserved. Now, the monks need a permanent centre to continue their work. With land secured, a global fundraising effort is now underway to build the facility they need. In 2003, a small group of monks began specialist training in the repair and preservation of Bhutan’s sacred thangka paintings. Thangka paintings are Himalayan Buddhist paintings on cotton or silk, depicting a Buddhist deity, scene or mandala. They not only serve as important teaching tools in Buddhism, but as sacred artworks and cultural treasures. Thangka paintings are admired across the globe for their spectacular imagery and quality artistry. They are not merely beautiful to behold, they are also a vital living tradition with priceless sacred and historical importance for society, especially to the people of Bhutan. Due to their delicate nature, countless antique thangka paintings are currently in danger of deterioration - it is crucial that they be restored and preserved for future generations. monk conservators of Bhutan’s Buddhist Art & Cultural Centre. 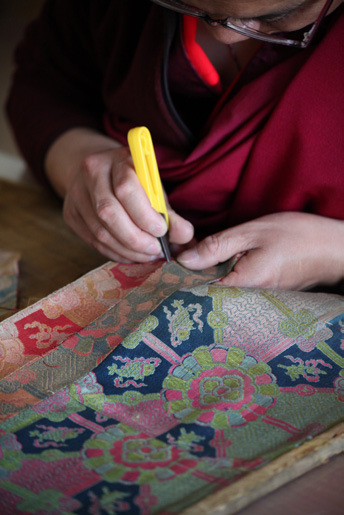 Collaboration is at the heart of our work to support Bhutan’s conservation efforts in preserving their sacred arts. To that end, The Druk Foundation for Art Preservation is honored to partner with the Buddhist Art & Cultural Conservation Centre, the Government of Bhutan and Bhutan’s Central Monastic Body. Together, our shared goal is the creation of a permanent workspace for the monk conservators and a home for the Buddhist Art and Cultural Conservation Centre. Sign up to receive the latest news on our progress and activities.